Glad to see you're doing Marvel Fanfare in the more logical story order, rather than the publication order. It really fits better here than anyplace else. Heck, if it weren't for the throwaway line about Cyclops being back at the mansion with a cold, I'd say it fits better before #150 (which is probably where it was intended to go anyway since Cockrum apparently drew his chapter before even returning to the title). Glad to see you're doing Marvel Fanfare in the more logical story order, rather than the publication order. Yeah, I fudged my rule on this one a little bit, since I wanted to cover all the issues in one post even though the X-Men aren't really in the first two issues much. The Index even lists their appearances in #4 in two different places, after Annual #5 and then again after #153 (because the epilogue to #4 takes place a few weeks after the main story, so presumably issues #151-153 occur in that period of time). I thought about doing the whole thing then, which would have put it closer to the publication date, but that just didn't seem right. Thankfully, I don't have too many more of these decisions to make (the Teen Titans crossover aside, which I can't quite place exactly even though it probably doesn't matter) until New Mutants rolls around. Yeah. It's an imaginary story. And I think it was long enough in the making, with inter-company consultations especially, that while there was lip service to it fitting into both teams' continuities (unexplained merged Earth notwithstanding, which is, like, the biggest "but" ever) there's no place in particular that it fits issue-to-issue. VW: archMC — Preeminent rapper. @Blam: while there was lip service to it fitting into both teams' continuities (unexplained merged Earth notwithstanding, which is, like, the biggest "but" ever) there's no place in particular that it fits issue-to-issue. Yeah, I have to skim the issue, but I think there's a reference to the events of issue #155 or #156 in it, which would place it between #157 and #158, but I need to double check that, as well as the issue's actual publication date, to see how far off from that covering between #157 and #158 would be. 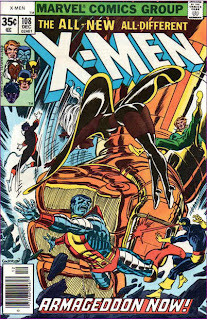 Of course, with the X-Men line-up as presented in the story, it could fit anywhere between issues #150 and #171, if it "really" fits anywhere at all, as you say.